Last weekend, the elders at Grace Community Church, a Grace Brethren church in Mississauga, Ontario, Canada, officially commissioned Willy Sanchez as the new pastor and church planter of the next Grace Brethren church to launch in Canada. 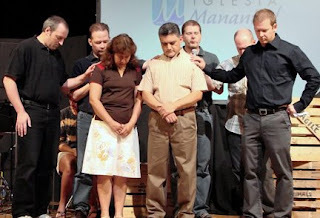 Willy and his wife, Mary, will be leading a team to plant Manantial (Spanish for ‘well spring’) in September 2008. They will begin house church meetings within the next couple of weeks, and in the fall, they will begin public meetings at West Credit Secondary School. The Sanchez family, originally from Guatemala, has been attending Grace for more than three years. During their time at Grace they have been small group leaders, have served as hosts on the First Impressions Team and Willy has occasionally played guitar or bass in the worship band. Willy also currently serves as an elder and executive board member. Willy and Mary have been involved at a high level with two previous church plants. “We are thrilled to be supporting them in this effort to more effectively connect the Spanish speaking community in Mississauga to Jesus and his wonderful love,” says Bart Blair, worship pastor and creative arts director at Grace Community Church. According to Blair, the Hispanic community is one of the fastest growing in the greater Toronto area. Mississauga, a city of more than 700,000, has only a handful of Spanish language evangelical churches. “We’re really excited about the potential this new church has at connecting with the spiritually disconnected,” he stresses. Manantial will actually hold their services in the same building and at the same time as Grace Community Church, thereby allowing their children and teens the opportunity to attend Grace’s English programs.